Now you can walk around you home in style or at least the style of the 11th Doctor. 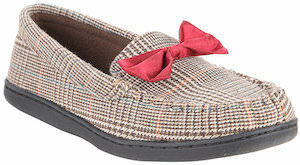 These Doctor Who moccasin slippers look a lot like the 11th Doctor. The seem to be the same fabric as the Doctor’s jacket and on top you find a red bow tie because bow ties are cool. So you feet can feel like you are wearing the Doctor himself. You can get these Doctor Who slippers in many sizes that cover men’s sizes 7 – 14 and yes of course they fit women to.